A superbly presented Queen Anne manor house set in a rural hamlet in approx 5 acres with a barn with consent for conversion. Thornhill Manor is situated in the quiet hamlet of Thornhill between the popular villages of Clyffe Pypard and Broadtown. Royal Wootton Bassett is located some 3 miles to the north, 8 miles to Swindon and 10 miles south to the attractive market town of Marlborough. Communications are excellent with the A3102 providing access to the M4 Junction 16 (4 miles) and regular train services to London Paddington from Swindon (approx. 55 minutes, reducing to 45 minutes after completion of electrification in 2018). The historic cities of Bath, Oxford and Salisbury are within driving distance. Schools include a primary school at Broadtown, Pinewood Prep. school, Marlborough College, St Margaret’s and St Mary’s Calne. The property is in a rural setting surrounded by fields with stunning views to the chalk escarpment and the Marlborough Downs to the south. This Grade II Listed Queen Anne Manor House, arranged over three floors with a cellar, is built of Flemish bond bricks with a platband giving a chequered effect under a stone tiled roof, cross windows with leaded glazing and elaborate wrought iron catch plates. At the rear is an earlier part of the building dating from 1596. The property has been substantially refurbished over the last few years and the accommodation is superbly presented and includes panelled formal reception rooms, a fine wide oak staircase in five flights of stairs reaching from the front hall to the second floor, window shutters and open fireplaces. The house offers a blend of historical rooms and styles to suit the differing seasons and requirements being ideally suited for formal entertaining and family living. On the ground floor there are two formal reception rooms with stunning views to the south and then two further reception rooms with open fireplaces, a breakfast room with French windows to the terrace, a kitchen, utility room and a cloakroom. On the first floor are two beautifully proportioned formal panelled bedrooms, a family bathroom, study area and master bedroom with dressing area and a large en suite bathroom. Two staircases lead on to the second floor which has two generous bedrooms, a bathroom and a further loft room which could be converted to provide additional accommodation subject to the relevant consents. 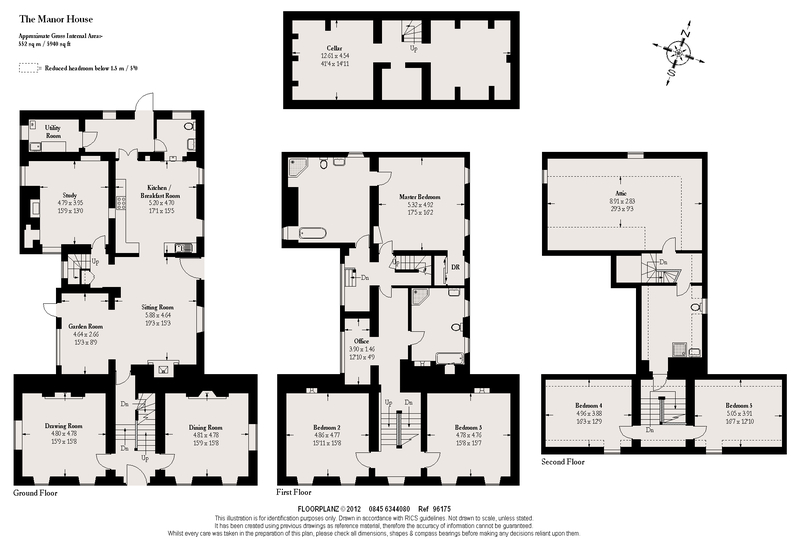 Ground Floor: Reception Hall, Drawing Room, Dining Room, Sitting Room, Garden Room, Study, Kitchen/Breakfast Room, Rear Hall, Cloakroom, Utility and Cellar. First Floor: Master Bedroom with Dressing Room and En Suite Bathroom. Two Double Bedrooms. Bathroom and Office. Second Floor: Two further double Bedrooms and Bathroom. Attic. The Manor House is approached over a tarmac driveway to a courtyard with ample parking and garaging for two cars and a single loose box of brick construction. A separate path leads through a walled garden with an ancient olive tree to a stone porch and Gothic door. A gravel drive then continues to sweep around to the front of the house to a turning circle with a pathway to the front door. The beautiful gardens surrounding the house with two paddocks amount to approx. 5 acres. There are well established shrubberies and borders bounded in part by old brick walls, yew hedging and fruit trees with stunning views over the Ha Ha, the fields and to the Hanging Wood beyond. There is an ornamental pond with reeds and water lilies. A gravelled path through rose covered arches leads to the terrace with mature Wisteria clad walls and Magnolia Grandiflora leading to a well established hedge area. To one side lies a small brick Outbuilding (which could be used as a studio subject to consent). On the west side is a small arboretum with silver birch, horse chestnut, maple interspersed with fruit trees. Lying to one side of the courtyard, this detached property comprises a former milking parlour attached to an older open cart barn, of brick and block elevations under a pitched tiled roof and currently offers workshop and storage space. Planning consent exists (ref: 05/0254/COU) to create a 4 bedroom property extending to 1894 sq ft, with open plan kitchen/dining/sitting room or could suit alternative use for an office, playroom or stables, subject to the relevant consents.